On Wednesday, December 17th a pipe broke on the Coconut Drive in the corner of Tropic Air and San Pedro Roman Catholic Primary School. 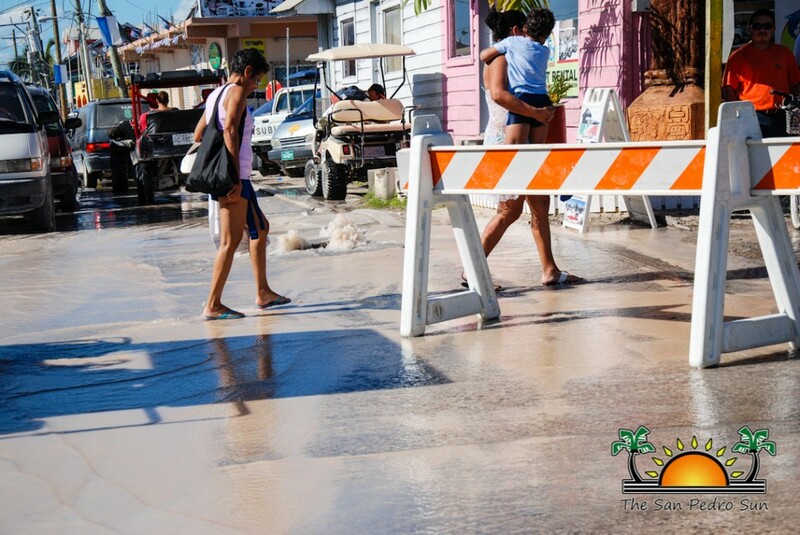 The breakage caused flooding in the immediate area and even water loss for the north half of the island. Fortunately Belize Water Service Limited (BWSL) quickly responded and had the pipe repaired and water supply restored on the same day. According to acting Operations Supervisor of BWSL San Pedro Branch, Jermaine Jones the pipe supplied water to a nearby fire hydrant. The rupture in the pipe was a result of aging, as the pipe is estimated to be more than 20 years old. “The connection that supplied water to the fire hydrant located next to the billboard on Coconut Drive broke at around 1:30PM. We were quickly alerted and responded. In order to conduct the necessary repair we had to shut down water supply to about half of the island. The break in the pipe was spilling tons of water. Once we were able to start repairs it took us about three hours to fully replace the broken pipe line with a new one and restore water supply to the area,” said Jones. Repairs to the pipe were completed at about 6PM on the same day. Jones stated that to ensure that broken underground pipes are handled properly, it is important that residents report incidents immediately. The longer the pipe remains broken, the more damage it can cause to the area. “Communication is everything. Breakages affect everyone. The faster we are informed of an incident the quicker we can assess the situation and carry out the necessary repairs. 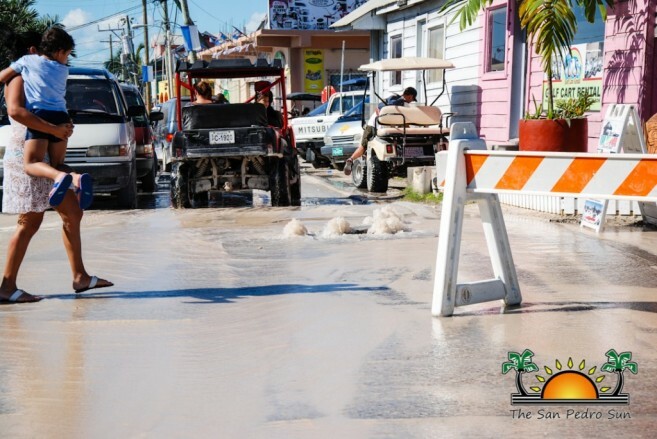 We ask for the collaboration of everyone when it comes to pipe breaks, please inform us the minute you notice a leak, whether it is on the street, residential or commercial lot,” said Jones. 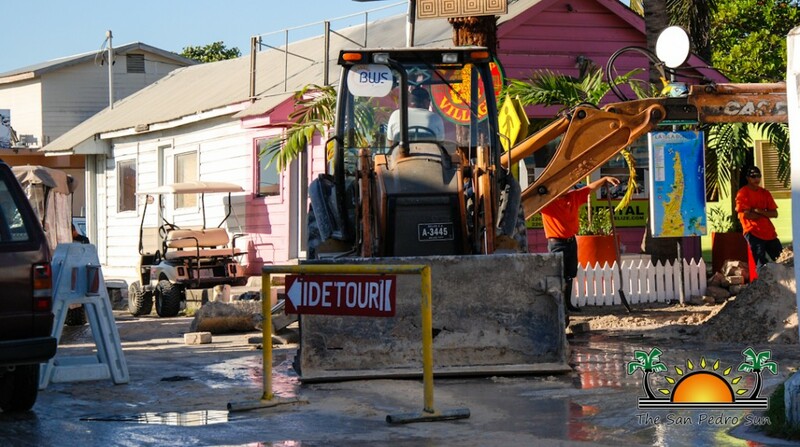 The San Pedro Town Council immediately begun working repairing on the street after the damaged pipe was replaced by BWSL. Concrete slabs will be placed to replace the cobble stones that were removed facilitate the repairs BWSL made. In order for the street repairs to take place the road has been blocked to traffic while work is being done. To report pipe leaks or breakages contact BWSL San Pedro Branch at 226-2749.